...to simplify matters, just look within the red circle. 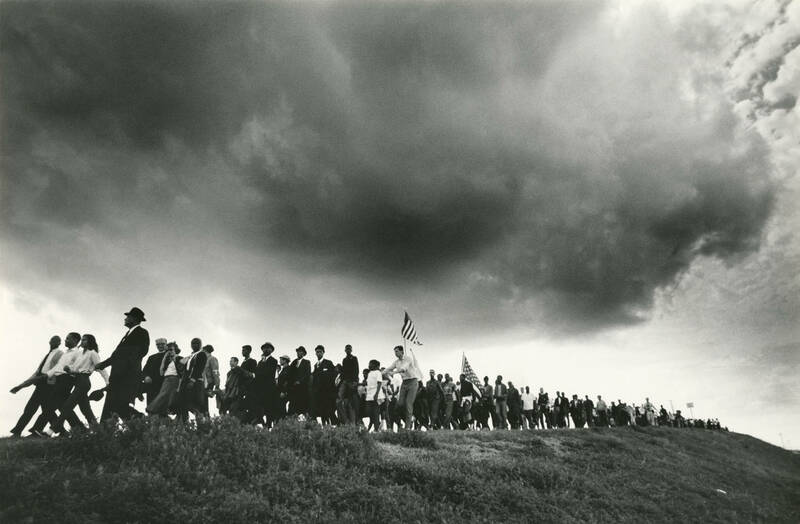 When the disembodied uncannily unbloodied head and face of the 1960s Civil Rights Movement's most irrationally intelligent icon, James Bevel, was discovered in the cloud in this ironically iconic photo of one of several famous marches he initiated - discovered shortly after his death in 2008 - people in the dozens were amazed. Since Bevel created and ran both the Selma Voting Rights Movement and its defining event - the Selma to Montgomery March - finding his face looking down and directly along the line of marchers only after he'd died was very creepshow creepy. Dozens of Ghost hunters were consulted. They fled on foot. When an underage Medium and an overpaid exorcist sharing an ice cream cone, swapping haunty stories, and picking each others pockets saw the picture, they dropped the cone, the con, and the conversation and did that hair-standing-up thing, then escaped out of their shoes. As only a brief glance at the picture made those with axes to grind grind them, then immediately run through a wall like one of those cartoon cats who'd smash their way through the bricks and leave their outline in them - then the 'toon music picks up and the end credits roll - the picture's iconic status was almost removed after a brief discussion by the American History Societies' StatusQuo Committee so it could no longer represent an era or an event (making sure yet again that James Bevel was still thought of as "Jim Bevel? Yeah, wasn't he a Bears running back in the '70s?") until the faces of Frederick Douglass (on Bevel's right) and Abraham Lincoln (larger, on his left) were recently found on either side of him. also looking down on the line of marchers! And no, Lincoln and Douglass are not seen debating. Dr. King made a late appearance in the cloud, could he be the black guy looking out from between the holes in the right-hand corner there? And nobody ever noticed this before? Come on in Alice Paul, the water's fine! Owing to Bevel's connection to this famous and effective march (it got African-American people the Right to Vote, and you know how that turned out! ), the late addition to the photo of Douglass and Lincoln (we're still awaiting the arrival of Alice Paul, although John Kennedy just checked in, large as life and clear as day and holding up his left hand in a thumbs up sign - you can find his face very large in the center mass of the cloud looking, as the others do, along the line of marchers. On his left, same scale, he's holding up his left hand in a thumbs up sign. JFK seems to be more evident on the smaller picture. Ah, and there's Dr. King now, very clear and peeking out from behind the clouds in the top right corner and looking, of course, along the line of marchers. There's one unidentified woman holding a long flaming wand, a suffragette is the guess but after further research she's looking more and more like the Goddess of Liberty, although it does seem like more suffrage leaders are trying to pop in! Welcome ladies! ), and also due to the fact that the copy of the picture on which Bevel's face was found was also the last thing he signed his name to while alive, may make this one of the most interesting pareidolias (a.k.a. meaningless shapes given meaning) on record. Some more things to marvel at in the photograph: Look at the priest both checking out and chicken choking the chick in the second row. They can never get enough. Either of them. And look at that strutting contest in the front row! To everyone's surprise and increasing daily profits in Las Vegas, it went on for the full 50-mile march, and is still listed as "Longest Strut Competition" in the Guiness Book of Freedom Movement World Records. And then, straight from the "Hay is for horses but you can't make them think" Revue, why is that white guy with the flag down the back of his shirt grabbing at the shoulder of the pre-teen in front of him? Wait just a darn minute, buster (see caption above, you can use that last guy and his pretty young protester shoulder-prey to find Bevel's face)! Well, like Mr. Caption tried to tell us, James Bevel's face can be found on the smaller picture if you squint a little and are really into small things. For the rest of us who like their cloud faces distinct, the picture is magically made larger below (you might have to scan over to the right, if you know how). Bevel's head and face float like a goblin, and his bald spot, beard, eyes, nose, mustache, and other facial stuff - like cheeks and unique bone structure - can be easily recognized by those who never knew him. He even seems to be wearing the Jewish skull cap he wore during his movements. And, as those of us who are pretending to see the image can easily see, Bevel's eyes in the photo are closed as if asleep, meditating, or getting marching dust blown into them. A few people claim to see him wearing an "I led my people into the promised land and all I got is this lousy tee shirt" tee shirt, but others claim that those keen-eyed lads and lassies must be on something stronger. Finally, when you find Bevel's eyes, stare deep into their closed lids. And when you start seeing stuff, good or bad or about yourself, scream or gulp all you want. You can run around like you've just seen the head of that headless horseman fella, or you can go all bug-eyed with legs-a-flailing in a standard vain attempt to back up into the furniture as you try to point at the picture but, as you just discovered, your hand is shaking so much that all you can do is knock over the coffee cup, which is preferable anyway, since it gives the other people in the room something real to talk about. ATS subpage, redirected to the main thread. The "King" picture and the circled one of Bevel above appeared first on this thread, courtesy of alienjuggalo.